Millions of consumers will hit the road for the long Memorial Day weekend and will find gasoline just a little more expensive than it was last year. According to the AAA Fuel Gauge Survey, the national average price of self-serve regular is around $2.36 a gallon, up seven cents from last Memorial Day weekend. 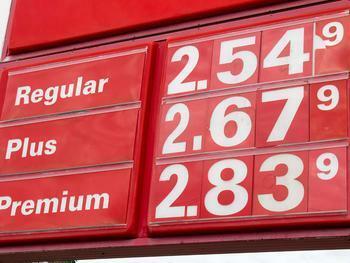 The national average price of premium gas is $2.88 a gallon, 13 cents a gallon more than last year. The national average price of diesel fuel is $2.50 a gallon, nearly 22 cents a gallon more than last year. Fuel prices have been relatively stable in the last few weeks, with fewer refinery issues to create supply bottlenecks. The main factor in this year's higher prices is the price of oil, which is trading higher than at this time last year. Demand for motor fuel is also rising. AAA estimates some 34 million people will take a road trip over the weekend, nearly a million more than last year. That could speed up the draw-down in fuel supplies, keeping prices at the pump a little higher over the course of the summer. While the national average price of gas has been relatively stable in recent weeks, a few states saw significant price hikes in the last seven days. AAA reports the statewide average price in Ohio jumped 10 cents a gallon, rose nine cents in Michigan, gained eight cents in California, and added six cents in Indiana. The Energy Information Administration (EIA) reports gasoline supplies fell in the West Coast region last week, resulting in upward pressure on prices. The price increases in California has pushed the statewide average over $3 a gallon for the first time in weeks. Supply is being held in check by routine maintenance at Phillips 66’s Carson refinery, Valero’s Benicia refinery and Tesoro’s Golden Eagle and Carson refineries. Drivers in the Southeast continue to enjoy the lowest gasoline prices in the nation. The statewide average for regular is $2.05 in South Carolina, $2.09 in Alabama and Mississippi, and $2.10 in Tennessee. Sanofi gets an exclusive on Zika vaccine; what do taxpayers get? Oil prices are plunging. Will gas prices follow?